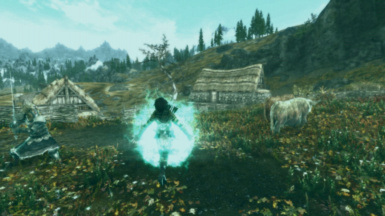 Adds teleporting scrolls\spells to the vendors in Skyrim. - Rebalanced tomes/scrolls prices to a more normal level. Tomes should be around 1500 gold and scrolls around 360 gold if my calculations are correct based on vanilla price multiplier. Added another condition to the earlier fix to avoid accidentally disabled fast travel. Apparently using function MoveTo() on player automatically enables Fast Travel if it was disabled before. This update fixes this behaviour. - Fixed the Mark and Recall not working if the player had only 1 scroll of either. This stuff teleports. You... and anybody near you within a small radius. Cautious use in crowded areas. Oh, by the way. Watch your back if you teleport away during combat. You might uhhh...teleport the attackers with you. Possibly all of them. 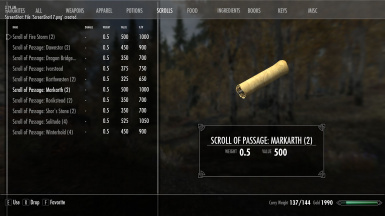 You can get the scrolls from general vendors and inns. As for spell tomes, you find those at mages who sell spells. Bring yo money though. This mod is best experienced with mods that disable fast travel. [!] This mod doesn't provide animations! For better magic animations I recommend this mod, specifically "YY Animations - Mystic Knight" which you find in Miscellaneous section of Files. - Compatible with everything. Load order doesn't matter. Unbelievable, right? - Scrolls are added to leveled lists through script, no bash patch needed. - You can cause issues yourself though. Don't use them during quests that implies scripted events. You've been warned.